CARCASS - SURGICAL STEEL - COMPLETE EDIT. (CD O-CARD) | Online Shop | Wizard LTD. Album: "SURGICAL STEEL - COMPLETE EDIT. 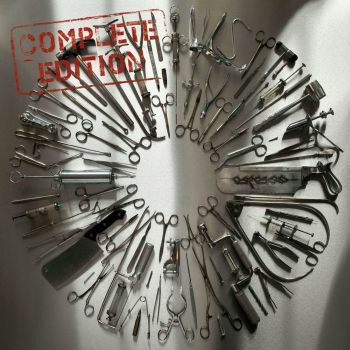 (CD O-CARD)"
British extreme metal icons CARCASS have just announced the release of a special edition version of their latest album »Surgical Steel«. The "Complete Edition" includes the whole album »Surgical Steel«, which comes packaged with the entire »Surgical Remission / Surplus Steel« EP. All the songs were recorded during the »Surgical Steel« sessions, which was produced by Colin Richardson (NAPALM DEATH, BOLT THROWER, GOREFEST, CANNIBAL CORPSE, SINISTER, RODRIGO Y GABRIELA) and mixed/mastered by Andy Sneap (MEGADETH, ACCEPT, EXODUS, TESTAMENT). The "Complete Edtion" will be available on CD and digitally on October 30th, on vinyl November 20th via Nuclear Blast.